Every day, patients at hospitals across the country are discharged with a physician order to have home health care. Hospitals are not obligated to share quality information with you/your family. Typically, a sheet of home health care providers with addresses are offered to the patient for their "choice". 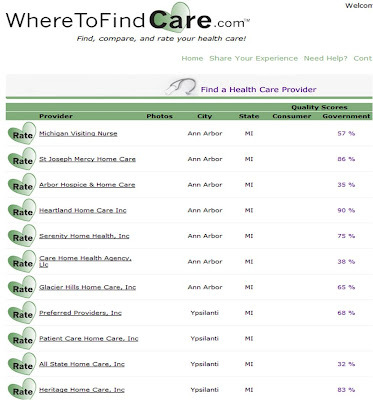 WhereToFindCare.com believes patients should have access to quality data when selecting their home health provider. 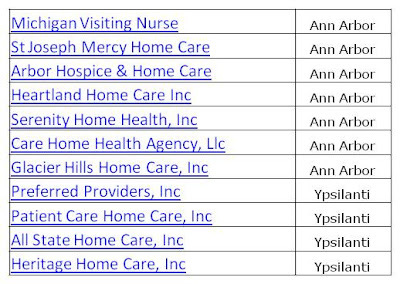 I have included snapshots of home health care agencies in zip code 48105. Can you tell me which one you would prefer to see when choosing a home health care provider for yourself or your family? or Name, cities and quality scores? Take a piece of paper and cover up the quality scores. Try to choose back on the remaining information. Take as much time as you need. Once you decide, remove the paper and take a look. Did you make any changes to your choice?